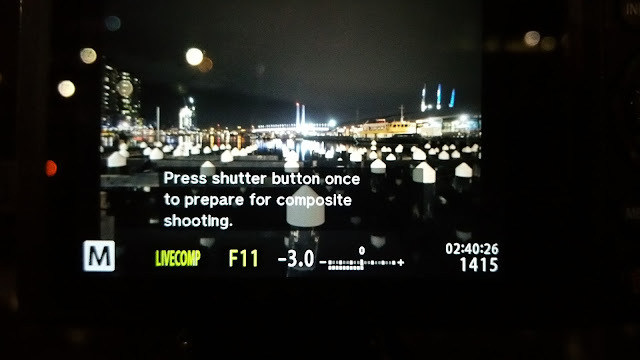 The Olympus OM-D series of cameras (OM-D E-M5 Mk II and E-M1) have an awesome feature called Live Comp which basically takes a base reference image then stacks a series (one or more) other images at the same exposure on top of the base image. This process is called composite stacking. The Oly version looks for changes in brightness so essentially sees "new" content in the frame to overlay on top of the base image. This opens the door to some amazing possibilities that would have had to be done in post in the past in a painful stacking process in Photoshop or some similar tool. The way it all begins is to set up your composition and work out what length of time is needed for your reference frame and subsequent frames. 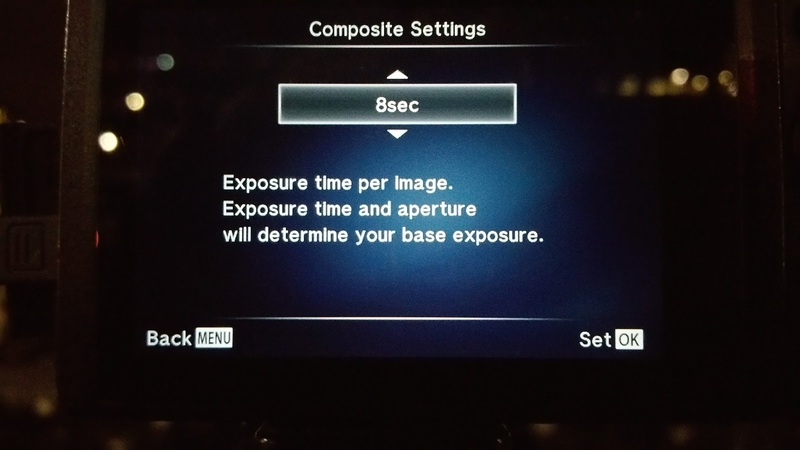 Do this in aperture or manual mode. You need to do this BEFORE turning on Live Comp because the rear display runs in a very dim mode once you start to avoid adding light to the scene and it's really hard to see. The image above is eight eight second exposures composited together in camera. This is the straight out of camera jpeg. The great news is that the camera still produces a raw (ORF) file for later tweaking in your favourite editor which is pretty amazing when you think about the software doing that behind the scenes. To get this magic to happen is simplicity itself and only requires a few steps once you know your exposure. Do your own exposure measuring, in my case I knew I needed 8 seconds at F11 ISO 200 by a previous test exposure. 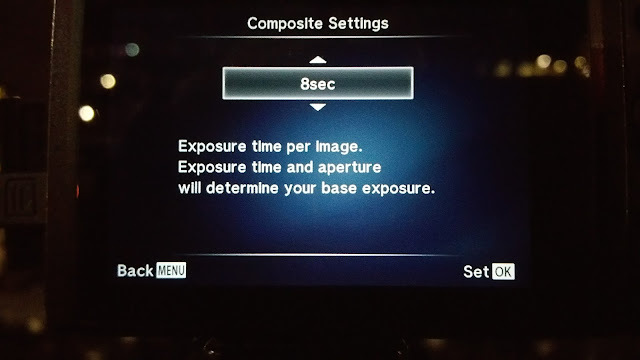 Put the camera into manual (M) mode - you know that mode you avoid all the time, I'm afraid you have to use it :). Spin the front wheel to set the aperture you want, in my case I wanted F11 for lots of depth of field. I focussed about 1/3 of the way into the scene. Now spin the rear wheel all the way through the available exposures going right past the maxium of 60 seconds until it shows LIVECOMP (see the image below). The camera will also advise you to "Press shutter button once to prepare for composite shooting" - don't do this yet you need to set your exposure. Press MENU and you'll be taken directly to Composite Settings - you can set this anytime, but this is a shortcut. I know from my test exposure that I needed 8 seconds. Note I like a dark sky, I hate it when the night sky is brightly lit which is what the camera will like to do if left to its own devices so that's how I set my exposure for night images - expose for the sky, especially when cloudy. Press the OK button and you'll drop back into the LIVECOMP screen ready to create the base image. Hit the shutter (I use a remote cable to avoid moving the camera). After this happens you'll see the screen below where it has a representation of your base image and is ready to go. Do this before the fireworks starts for best effect. Where I stopped one set and started a new set the base image includes some fireworks. Hit the shutter again to watch the magic start to happen. 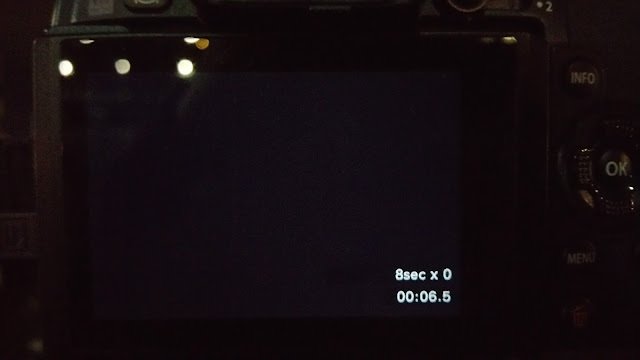 The screen will clear and display what it's doing in this case the first (0th) 8 second exposure and an elapsed timer. Right before your eyes your composite image starts to develop as each new exposure is composited in on bright places. The scene below was made before the fireworks started (so I could do this blog) and was then repeated to capture the fireworks. Just a quick note before we finish up, even though the fireworks session is quick, don't be afraid to grab your setup and hoof it to a new location. 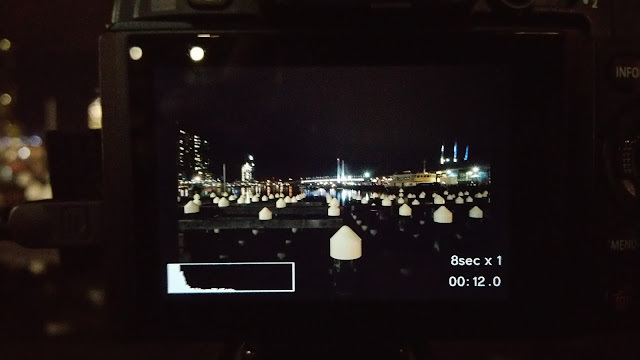 I did a couple of exposures here, did one with the docklands cow and crowd in shot then went left to get the reflections on the glass facade of the buildings that line the docklands waterfront. All of the images you see in the blog are straight out of camera. The cool thing about getting that raw is that you can do some later tweaking. Now a couple of words of caution - be careful that you don't capture too many bursts because guess what all those lovely colours add up to when composited and there are too many - yep - you guessed it pure white. 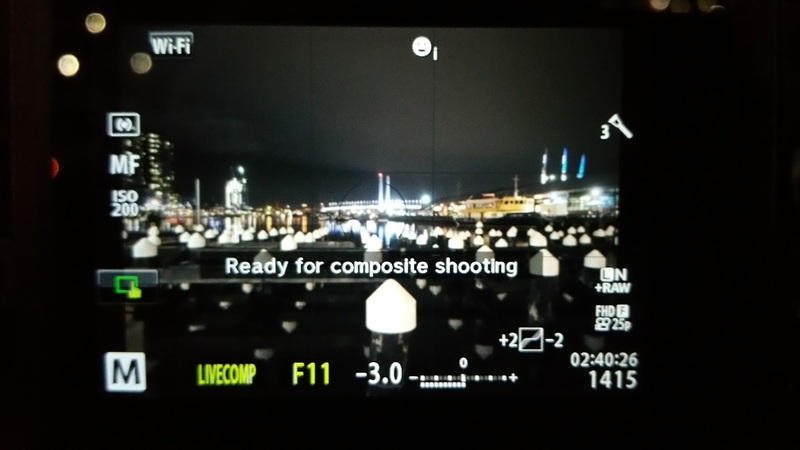 The good news is that as each exposure completes the composite comes to life in front of your eyes while the camera heads off to make the next one. You can stop the process any time by hitting the shutter button. The final caution is one that all long exposure enthusiasts need to be aware of, you're standing there concentrating on the scene in front of you and your gear. Watch the people around you too - one or two of the people in that crowd might be envying your stuff. Always keep your wits around you and be ready to move off in a hurry. This is the first of the exposures. In hindsight I should have waited because the early stuff is all low level and very bright which generated that lovely (not) white hot volcano of light in the middle of the image. I do love the reflections among the white caps of the old dock piles. In this next one I got some lovely high bursts that really made the shot and while I liked the reflections I didn't want all the shots from the same place. I wanted to include a few of the foreground and the crowd to give some interest. Fireworks are B-O-R-I-N-G by themselves! I tried the grass area but wasn't all that happy with the outcome until the next shot where you can see the reflections nicely in the buildings from the bigger bursts which told me to move closer to them. This final image was closer to the buildings, but alas too many frames. It got the dreaded white out. I've included this image so you know what not to do... the good news is you know those beautiful reflections are going to be used in another image now don't you :).